একটি কমন সমস্যা-নতুন Windows-Setup দেয়ার পর কম্পিউটারের যে Condition থাকে তা কয়েকটা Software Install দেয়ার পর আর থাকেনা! Tuning Software সমস্যা সৃষ্টি করে অনেক সময়। ‘WinSysClean X3‘ registry এবং disk cleaner সেই সাথে CClener এবং Advanced System Care Pro এর থেকে বেশি Secured. এর বিভিন্ন Feature গুলো দেখলেই বুজতে পারবেন! “the most effective registry cleaner, there is no other registry cleaning tool which is easier to use or more effective than WinSysClean with just a single mouse click. WinSysClean is safe, it uses complex analysis to skip important data from removal. Other tools are dumb, they ask you what to delete and what not, which takes you time and sometimes they make your demolish your Windows. WinSysClean is different from any other System Cleaning Tool, it uses advanced registry and file analysis in order to detect invalid entries, so you don’t need to make critical decisions to confirm which entries/files to be removed, because WinSysClean does this for you safely. You can also view a complete log of the operations executed by WinSysClean, after a cleaning process. 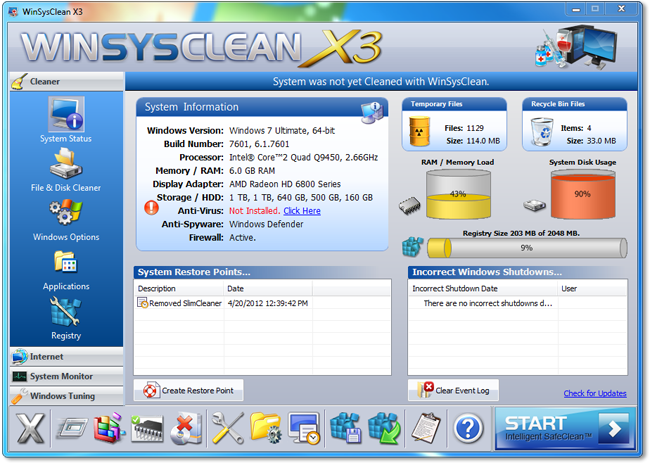 To get your free copy of WinSysClean X3, visit and register at promo-page –http://www.usro.net/de/WK/WX3V/. UPDATE : The provided installer does not seem to have any registration option, here is alternate installer http://anonymz.com/?http://www.mediafire.com/?qgkwx55ub4kdr44 (Via third-party, unverified source). অপ্রয়োজনীয় এ্যাপ্লিকেশন প্রসেস অপ্টিমাইজেশন ও পিসি স্পীড আপ করার অসাধারন এক জিনিস। ফুল ভার্সন একদম ফ্রী তে ! !